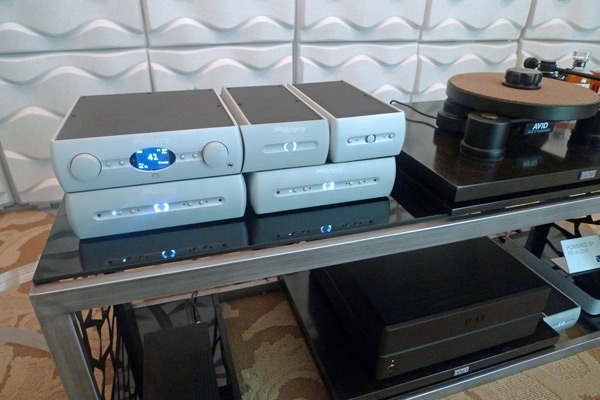 Last year, I raved-reviewed the Hegel H160 integrated amplifier. It was probably the best all-around integrated amp I studied. I laughed that it had only two analog inputs but six assorted digital ones. I didn't laugh while the H160 grabbed every loudspeaker in my house by its cojones and gently forced the frightened cones to submit. Maybe it was the black mask faceplate or maybe was Hegel's SoundEngine technology. I don't know, but unquestionably, the H160's 150Wpc (into 8 ohms) had a very special way with speaker cones. 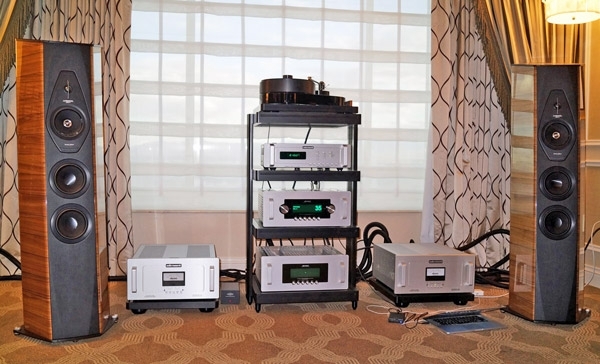 The tube warmth of the aluminum-chassis, leather-clad Absolare Passion integrated amplifier ($24,750), a hybrid SET design with a tube preamplifier section and solid-state dual mono amplifier section that aims for a "tube sound," was a touch of heaven amidst a limbo of grayness. How lovely, after encountering a number of gray-tinged presentations in other rooms, to again hear lots of enjoyable, warm color. Coming from the pro market, where active loudspeakers have been the norm, ATC is a major advocate of the active approach. According to ATC, the advantages include more accurate crossovers, lower intermodulation distortion, improved frequency response and stereo matching, and better low-frequency control. 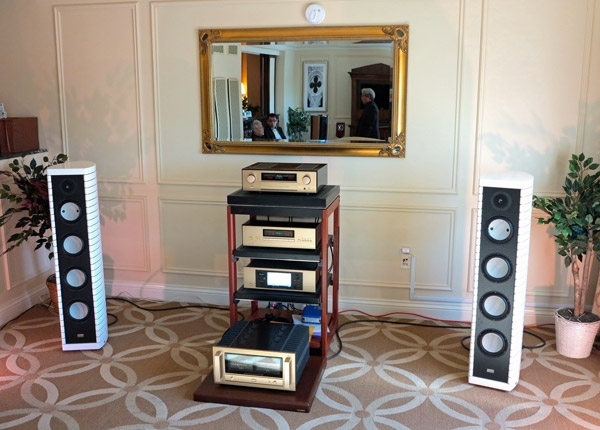 The active speaker from ATC being demoed at CES was the SCM40A, ($12,999/pair; $6999/pair in the passive version). 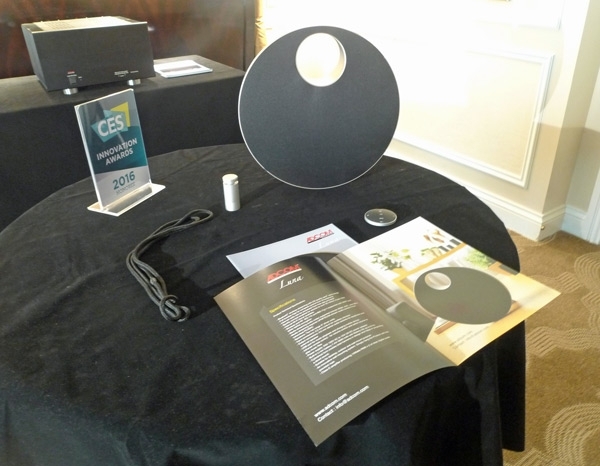 Adcom introduced two new products at CES 2016: The 250Wpc, GFA-565se stereo amplifier ($1499, rear) and the Luna wireless music system ($599, front). Like the Naim Mu-so, Adcom's version of "industrial design awesomeness"the Luna also connects in the most happening ways: WiFi, aptX Bluetooth, USB, UPNP/DLNA, 3.5mm analog input and headphone jack. 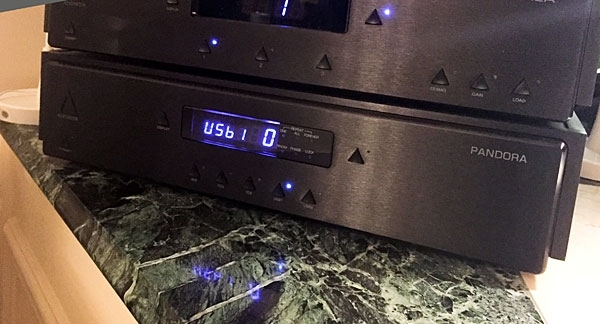 The Pandora is a tube-based DAC with one USB and three SPDIF inputs, which also forms the basis for the Romulus CD player that I reviewed favorably a couple years back. 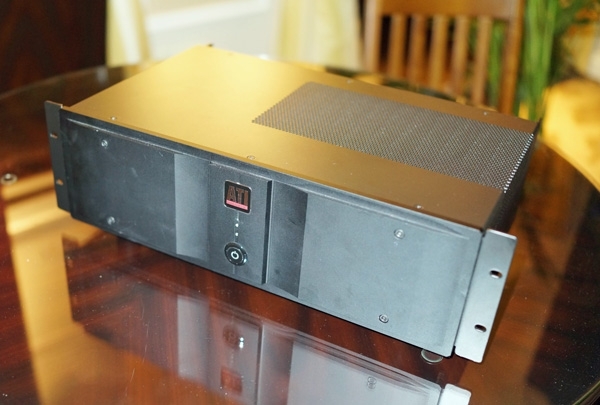 Aesthetix has now updated both products with what they call Eclipse upgrades, which include StealthCap capacitors, improved chassis damping and isolation, and upgraded grounding design in the power supply. The Pandora DAC is now $12,000 with the Eclipse updates. Accuphase's head of engineering, Masaomi Suzuki, introduced the company's new P-7300 flagship class-A/B stereo power amplifier ($32,000). The amp claims ultra-low noise and a super-high damping factorthe clipping power is higher than before, and the amp is 50% quieter than its predecessorand outputs 125Wpc into 8 ohms. Its versatility extends to outputting 800Wpc into 1 ohm, which means that loudspeakers with challenging, amp-wilting impedance curves should not present insurmountable problems. 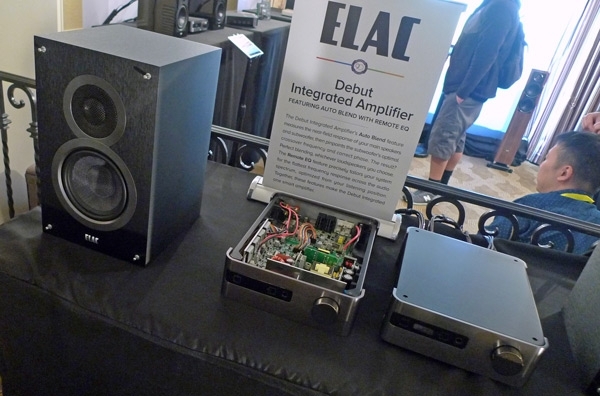 ELAC America introduced a new 100Wpc, class-A/B integrated amplifier with a switching power supply, the "Debut Series DA101EQ" ($499), which looked so Walter Gropius' Bauhaus: Moderne. I was deeply impressed by its industrial design quotient. Hidden inside its elegant 2.1-channel skin, the ELAC integrated includes an "Auto Blend" control feature that measures the nearfield response of your main speakers and subwoofer and then corrects phrase and adjusts crossover frequency to suit the listener's room. Amplifier Technology Incorporated's John Baloff showed me their new 4007 class-D amplifier during a brief visit to their room. "Baby brother" to the company's 6000 amplifier, the 4007 ($2995 for the 2-channel version; the amplifier is available in 4-, 8- or 12 channel versions) delivers 180Wpc into 8 ohms, using new "extremely quiet" NCore class-D modules. The surprising combination of the superb-sounding (but prototype) Technical Audio Devices Laboratories (TAD) loudspeakers with the wonderfully affordable Audio Alchemy electronics manifested some penetratingly beautiful Roy Orbison music. 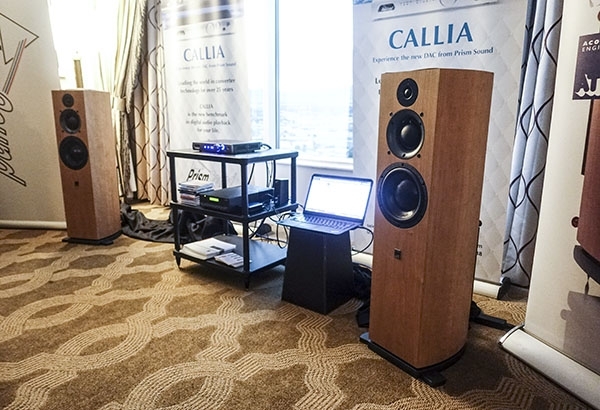 Audio Alchemy was relaunched again in 2015 with a stellar lineup of designers including Keith Allsop, Peter Madnick and Dusty Vawter. 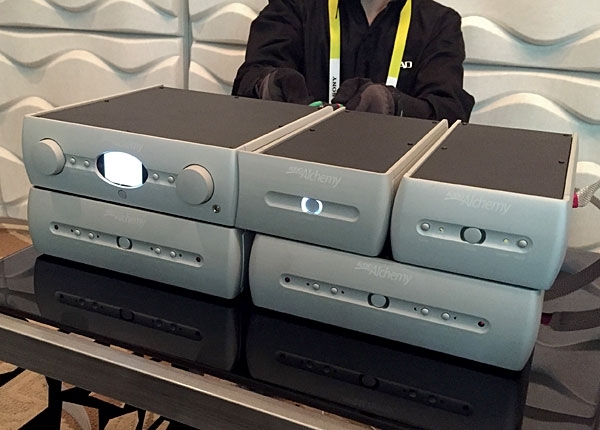 And it appears no expense was spared showing their product line up at CES. Occupying one of the larger suites, with co-exhibitor TAD, at the top of the Venetian only served to emphasize how compact the products are. Audio Note Japan, the company whose expensive gear was designed by the late Hiroyasu Kondo, is poised to replace its M Series with the new G Series in the 2nd or 3rd quarter of 2016. 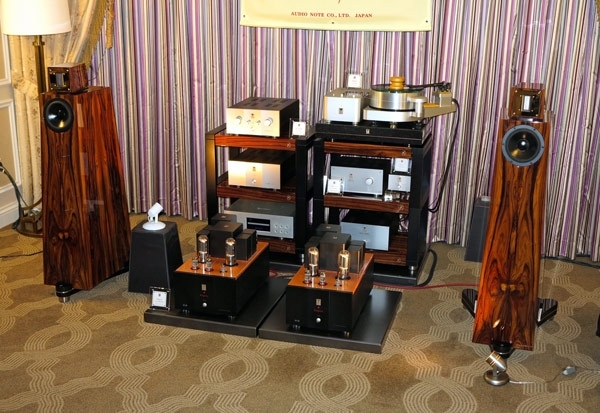 Among the new products playing was the forthcoming flagship preamplifier, the G-1000 ($100,000 approx.). With the former 37-step attenuator replaced by a quieter 57-step attenuator, bigger and better proprietary silver capacitors, and an expanded power supply, the preamp reportedly retains the same tonal character as its predecessor. 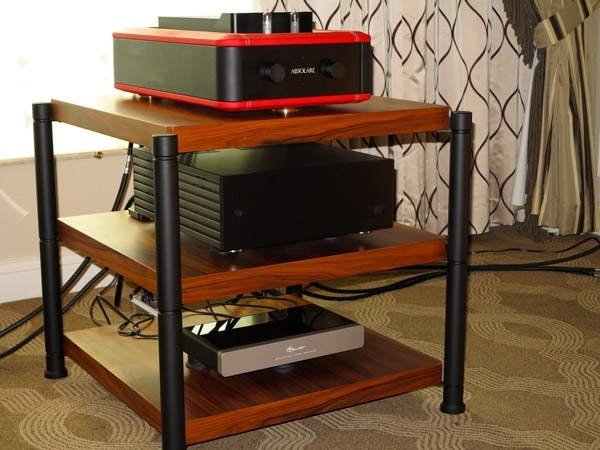 Audio Research's Director of Marketing, Brandon Lauer, gave me a tour of the company's new value-oriented components, including the $16,000 GSi75 tubed amplifier rated at 75Wpc; $14,000 Reference Preamplifier 6; and the Reference Phono Preamplifier 3. Audio Research has replaced the KT-120 output tubes in all their amplifiers, including the GSi75, with the Sovtek KT-150 because of its superior reliability and longevity. 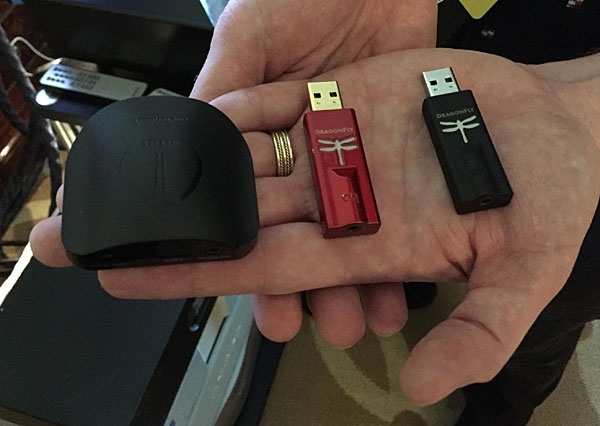 Kicking off CES early, AudioQuest held a press conference Wednesday morning to present their three new portable DAC/Headphone amps to the public for the first time. Designer Gordon Rankin and AudioQuest's Steve Silberman were on hand to explain the new products and run a brief demo. 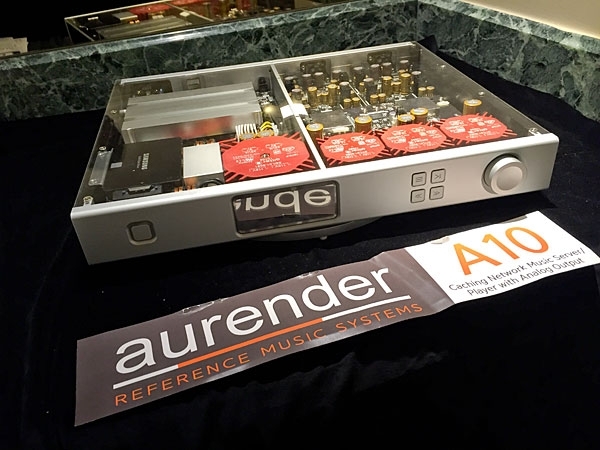 The new Aurender A10 should be arriving this summer for approximately $5,000 and should cover just about all of your digital file playback and streaming needs. Inside will be a 2TB drive for storage and 120GB SSD cache to improve playback quality, with Tidal native as well. On the back are both balanced and unbalanced analog outputs and USB, Ethernet and optical digital inputs. Formats handled include PCM up to 32/384 and DSD128. 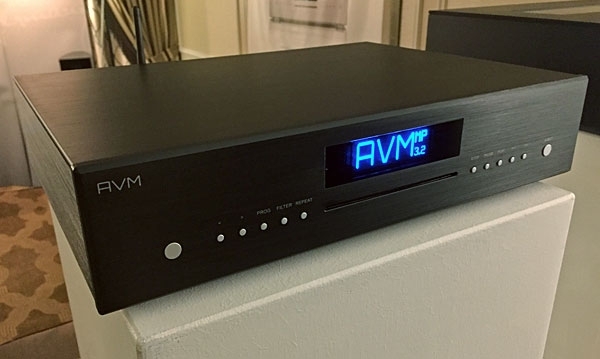 AVM has three lines of products ascending in quality and price: Inspiration, Evolution, and Ovation. Pictured above is the Evolution MP3.2 Media Player with built-in Teac CD transport that handles PCM up to 24/192 and DSD64. There are six digital inputs, digital volume control, iOS and Android apps and Tidal integration.